Just three weeks old, the newly minted opening weekend box office record is already in jeopardy from a bunch of pirates. In any event, we're headed for an unprecedented third $100 million opener of this month, something that hasn't even happened in one year before. Pirates of the Caribbean: At World's End is the third and potentially final outing of Disney's surprising cross-over amusement park adaptation. Propelled by one of the definitive movie star turns of all time in Johnny Depp's Jack... sorry, Captain Jack Sparrow, the Pirates franchise ranks as one of the strongest in cinema history. The first film opened to a modest $46 million, but due to that oh so rare commodity in movies today, legs, it ended up north of $300 million in final box office. Realizing they had lightning in a bottle, Disney quickly greenlighted two back-to-back filmed sequels, the first of which premiered last summer. 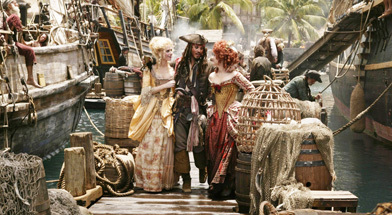 Dead Man's Chest proved even more successful, setting the single weekend box office record and grossing $423 million total. That was merely the first half of a cliffhanger, which saw Captain Sparrow meet an apparent noble end at the... tentacles of the Kraken, sent by Davy Jones. Of course, if you've been paying attention to any of the commercials, you know that he's back, somehow. He's not the only character to escape death, apparently, as the ending of Dead Man's Chest brought back his nemesis/newfound-ally Barbossa (Geoffrey Rush) from his exit in the first film.